Okay, so if you read my earlier reviews, then you know that I am not a big fan of reviewing an album track by track. 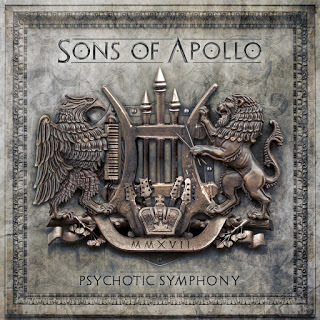 Sometimes I will do it, but in case of the album Psychotic Symphony from supergroup Sons of Apollo it’s virtually impossible! The album really stays true to its name. Upon listening to the album for the first time, it immediately becomes clear that we are dealing with phenomenal musicians in their purest form. The title of supergroup is therefore well deserved! The opening song God of the Sun actually consists of three parts. In the first part you can hear heavy guitars, powerful drums, and raw rock vocals. After five minutes the song becomes calmer and it is apparent that singer Jeff Scott Soto has quite versatile vocal capabilities. I am saying quite because I think that with Sons of Apollo it isn’t about the vocals and to be perfectly honest, I do not find the vocals that inspiring or mind blowing, but that might be a matter of taste. Don’t get me wrong, Jeff Scott Soto does exactly what he has to do, he can carry the songs like they were meant to be sung, with a lot of dedication and he definitely belongs in this supergroup, because it all fits really well together, but I can’t escape the feeling that I think something is missing. Like he can’t bring his A Game all the time. But this might also have to do with the fact that this guy has some amazing musicians that are surrounding him. Take for instance keyboardist Derek Sherinian, in the song Labyrinth he plays an amazing keyboard solo, one that is nothing less superior to the constant guitar violence of virtuoso Ron “Bumblefoot” Thal. This in my opinion underappreciated guitarist, who had the extremely ungrateful job of helping Mr. Axl Rose by replacing Slash in Guns and Roses, a much better choice than Slash if you ask me, on this album shows that he is much more than a replacement of an overachieving rock icon who isn’t half as good as people make him out to be. Nonstop Mr. Bumblefoot gifts the listeners with stunning solos and tight rock riffs. Like I said earlier, the album does its name justice. By placing all of these wonderful musicians together, it sometimes can become a little bit of a contest to show which musician has the best skills. This last remark might be a little harsh, because that would mean that they didn’t think about the structure and the content of the songs, which I think isn’t the case at all. On the contrary, I think that the musicians find each other very well and everything is well thought off, even the smallest details. Halfway down in the tracklist there is the song Alive. In this song we can definitely hear that Jeff Scott Soto is more versatile than you might think at first. This is because of the quieter intro of the song. The last song of the album Opus Maximus is completely instrumental and serves as a perfect closer. Here, Sons of Apollo show what a bunch of great musicians they are once again! But I haven’t really talked about one very important thing yet and that is fantastic drummer Mike Portnoy. This man shows during the whole album that he is a phenomenal drummer who can throw out the most complex drum parts thinkable! He excels without letting his attention slip for even the second! This man is absolutely great! Sons of Apollo is a band which you might have to get used to, the musicians are technically very good, but it sometimes lacks a little bit of passion. The vocals don’t excel and the song texts are merely superficial. All of this is more than made up for by the fantastic musicians that the Sons of Apollo are! In my opinion Psychotic Symphony is an album for the real music lover!! !